A transcript is a complete record of your academic history. It lists classes in progress, classes that have been completed, grades received and other information relating to your academic career. Transcripts are printed on security paper and bear the signature of the Registrar. Students can request either an official or unofficial copy of their transcript. • Applying to graduate school etc. Records will only be released with the written consent (signature) of the student and submission of the Request for Transcript of Official Record (pdf). 1. There is a fee (Canadian, cheque or money order) for EACH transcript processed ($10.00 per Official Transcript; $5.00 per Unofficial Transcript). The only exceptions are Incoming Exchange Students (students must request an official transcript be sent to their home institution) and NSCAD and students applying from within NSCAD for Exchange/Off Campus. 2. If special delivery, express service, etc. is required, courier fee and surcharge of $5.00 will apply. 3. 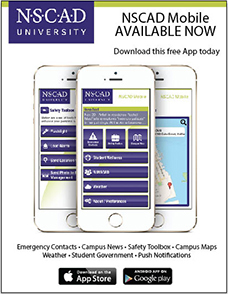 Transcripts will not be issued if there is an outstanding account with NSCAD University. 4. Student Records are confidential; transcripts are issued only upon the written request of the student. Requests accompanied by Credit Card information to cover the fee may be faxed to (902) 425-2987. 5. Transcripts are prepared once per week on Thursdays. Requests must be received by the Wednesday of the current week or they will not be processed until the following Thursday. During peak periods, such as the end of a semester or for semester-end transcript requests, at least one month should be allowed for processing. RUSH (Official or Unofficial) transcripts are available within 24 hours, only if staff availability permits ($20.00). 6. High School transcripts and other documents on file cannot be released by NSCAD. For transcripts from another university or college, contact the Registrar of that institution.